Commonly,you meet white sand in beach shore. But this time, you can meet white sand in the edge of a lake. 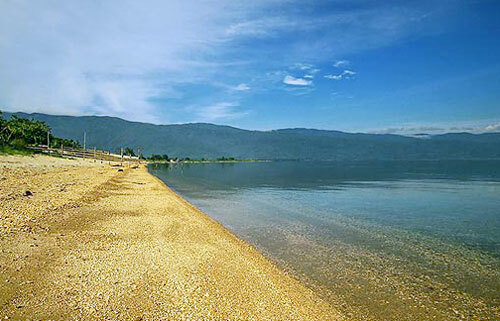 Poso Lake which located in Poso, central Sulawesi, has white sand which cover almost all the lake’s shore. White sand in Poso beach is similar to white sand that you usually see in the beach shores. Besides, the edge of Poso Lake is also covered with yellow sand. The yellow sand texture is similar to the white one, it’s just colored yellow. As the 3rd biggest lake in Indonesia, Poso Lake has 32 km length, and 16 width. The beach is spread out approximately 127 km, surround the lake. With the deepest point about 510 m and the average depth is 195 m, Poso lake is included to be one of the deepest lake in Indonesia. 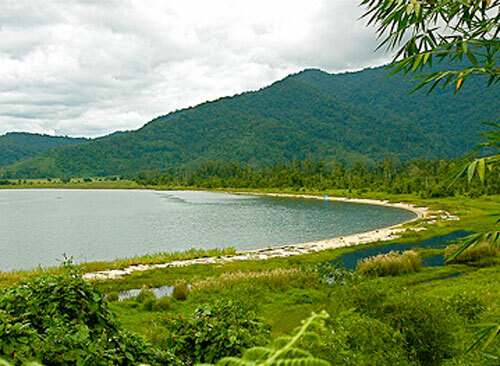 Located in 657 m above sea level, Poso Lake has amazing scenery. It surrounded by hills and forests, so you can enjoy the lovely view while exhaling fresh air. The white clear sand which reflects sun shine, and the lake’s preserved ecosystem, has made the panorama looks even fresher. Poso Lake has a very clear water. Even in rainy season, when the rivers that end up in this lake, are carrying flood, Poso Lake remains clear and not muddy. In this lake, you will also find situations which are not so different as when you’re in beach shore. The clear green water in the edge, and the blue clear water in the middle of the lake, will make you feel as if you’re in a beautiful beach shore. Don’t forget to bring your change clothes if you visit this lake, because you will definitely want to swim in its calm and clean water. In the shallow part of the lake’s edge, you won’t find any rock till the bottom of the lake. The bicolor sand which covers the lake is also cover the base of the water to the deepest part of it. So it’s so safe for you to play in the shallow water. Your feet won’t be hurt because there isn’t any rock in the bottom of this lake. Your eyes and your throat will not be painfull either because the water is fresh water, not salty one. 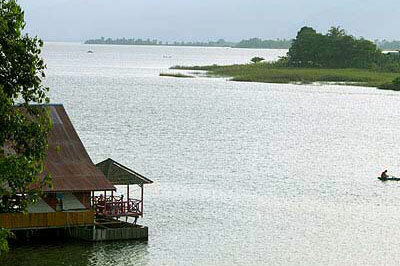 If you’d like to go across the Poso lake’s edge, you can rent motor boat (ketingting) which available around the lake. By going around the lake, you will find magnificent views. You will also see the daily life of the local people, like fishing, netting fish, or fish plantation in keramba (woven basket in oval/ circular shape, usually used to breed fish in lake/sea). For you who like to do fishing, you can do this favorite activity here. If you’re lucky, you might get Sidat fish/Sogili fish which can reach to 2 m length. This fish is an endemic fish of Poso lake and also the biggest fresh water fish in its kind. The view around Poso Lake is also remarkable. Green mountains and hill are surrounding this lake. Once in a while, you will find few kinds of birds flying across the lake or tweeting in the forest. In some places, you will find groups of huge rocks which likely come out from inside of the lake, as it’s a floating rock complex. The local people call the rock complex as Watu Ngonggi and Watu Mpangasa Angga. Watu Ngonggi is a collection of rocks which will make a sound when it’s hit. Around Poso Lake, in the area of Tentena village, you can also see some caves. Those caves are quite deep. Some of the cave’s depth even reaches into the lake’s bottom. In one side of Poso Lake, you can visit biggest orchid conservation in Indonesia called Bancea Natural Tour Park. In this 5,000 hectares park, you will enjoy the beauty of orchid from various types. One of them is the rare Black Orchid. You can take a rest a while in this park, while taking pictures. This calm and wide lake can be reached by Tentena city, Poso district, central Sulawesi. 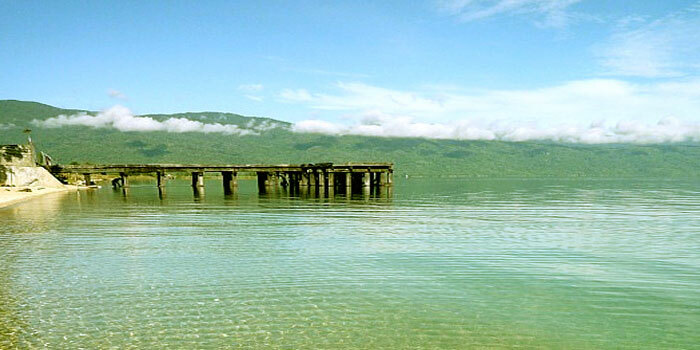 Poso Lake is relatively easy to be reached because it located near the Sulawesi Trans Route, a route which connects Toraja-Poso-Gorontalo-Manado. Poso Lake is located around 285 km in the south east side of Palu city. Poso Lake can be reached from Palu city by land transportation in more or less 8 hours trip. 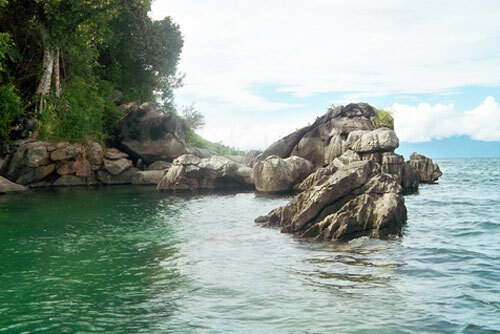 This lake is also located 56 km from south side of Poso city. From Poso city, Poso lake can be reached by land transportation in 1,5 hours. There are some facilities and accommodation around Poso Lake, like hotel, guest house, home stays, and restaurant. But if you want to stay the night relatively safe, you can look for it Tentena city center. One of recommended hotel nears Poso Lake is Ue datu Cottages. There’s also motor boat rental if you’d like to explore and to follow the Poso lake water area.